Finches eat seed. That's a very true, and a simplistic statement. In reality seeds alone are not enough to maintain optimal health. While I'm a strong believer that seeds should be the basis for any finch diet I also know that a seed only diet will usually result in an unhealthy finch in the long run. You see wild birds visit your back yard feeders and happily take the free seed feast you have laid out, and most people will agree that wild birds eat more than seeds alone. They can be seen picking around in the ground looking for little bugs, or in bushes and trees looking for berries, sap and fresh greens. Over all a wild finch has a varied and complete diet. When they are lacking something in their body they crave it an instinct will help them locate a food source that will give them the nutrition they require. What many people don't always realize is that little finch in your living room aviary is also a wild finch. Wild in its' own respect, but domesticated by capture or breeding. However it is still very wild in a biological aspect. 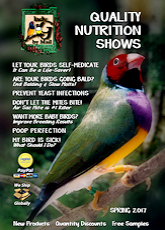 So why do so many assume that a bag of finch seed mix is enough to keep little finch happy and healthy? Granted when I was first starting out I thought seed was all my finches needed. That was what I had been told to feed my finches by the pet store where I bought them. Over time I learned a lot from other breeders, magazines, books, web sites, and simply by watching my finches natural behavior. They would spend a great deal of time hopping around on the floor of their cage apparently looking for something. Then it just hit me one day that the birds in my backyard did the same thing. They were looking for something else in their diet. I didn't jump to bugs right away. I opted for something simple, a little lettuce on the floor of the cage. It didn't take them long to start munching on it. So I tried sliced grapes, a big hit in the finch cage. A breeder suggested hard boiled eggs and my finches took to the new food instantly. Now my flock eats a wide variety of foods and their over all health and condition has improved greatly. Normally only living an average of 5-6 years suddenly the finches were living 9-11 years and producing large clutches of more robust offspring. 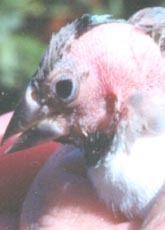 My oldest finch died at 12 years old and he was producing and raising healthy chicks until 3 months before his death. This can sometimes be a problem. Most finches in the pet trade are only offered seeds. They have no one to teach them what they can and can't eat. Often they fear new foods when they are placed in the cage. If you are patient and work slowly it is possible to teach most finches to eat foods other than seeds. I usually suggest you start with a very simple food like cooked white or brown rice. Rice is small and doesn't look as threatening as a 4-inch piece of celery poking through the bars of the cage as though it were trying to grab the finch. A little rice can even be put on top the seeds if your finches will not go to a treat cup. Just a tiny amount is needed to get them started. If they wont eat it one day, try again the next. More often than not they will eventually try it. Once they understand that the rice is a good food item, move it in to a treat cup. Once the treat cup is established as a good place to go for extra food try putting in other fruits and veggies: Corn, Peas, Green Beans, Strawberry, Grape, Mellon. Don't forget that a little goes a long way and don't over feed any one item. Too much of any one thing is never good. Pellets have their place but on the whole I do not like them. My finches never liked them much either. Pellets are marketed as an all on one super food. I'm sorry but there is no such thing. If your finches look scruffy on a seed only diet and you switch them to pellets they will indeed look better, but only for a while. Eventually they'll bounce back to scruffy because while pellets may have more of some things they lack other things. No single food item is perfect or good enough. You can offer a pellet and seed mix diet, which would be better than using one or the other as a sole diet, but you may still find that it isn't enough. Could you live on bread and those protein power drinks your whole life? Probably, but would you want to? There is also the issue of the pellet quality. With seeds you can look at them, smell them and often tell if they are good or bad. Pellets are so processed, baked and compressed you really don't know if the ingredients used were good or spoiled. You can only trust that the manufacture is dealing with only reputable suppliers and has a good quality control program in place. In addition pellets aren't a 'natural' food. They are man made of course. Wild finches don't need humans to make food for them, why should your birds be any different. Given the choice most finches will prefer seeds of pellets any day. The finches' beak is designed for hulling seeds, squishing juicy bugs and pecking apart plants. Finches do eat bugs. Bugs are an excellent source of protein, which is necessary especially during the breeding season. The hungry mouths in the nest will grow fast and need everything they can get. Not all finches need to be given live foods to breed thankfully. Many of the most commonly found species do very well without the live bugs in their diet. More exotic finches such as Waxbills however do need a lot of protein in their diet to get the breeding season started and to raise their chicks. Two of the most commonly fed live foods are maggots and mealworms. Both are very good for your finches and are cheap to buy from most pet stores. Always buy live food from reputable suppliers; do not dig up bugs from your backyard. Bugs that come from outside can easily bring disease and parasites in to your flock. If you do manage to balance out your finches diet that great. However it's actually very difficult to do even with all the foods available. Calcium, Iodine, Vitamin D3, Vitamin A are just a few that are very hard to find in most foods. In fact D3 is produced primarily within your birds own body. It is produced as a reaction to full sunlight on the skin. Unless your birds live outside they most likely aren't making enough D3. Without D3 calcium isn't used correctly. It becomes a chain reaction that leads to poor feathering, weak muscles, egg binding and a host of other ailments. Even I use supplements in my birds diet. I use commercial egg food that contains the extra nutrients. I also use Calcium Plus, Feather Fast, Thrive and Hearty Bird on a fairly regular basis. 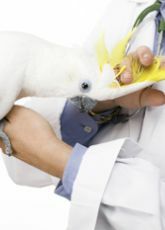 These supplements and many more are even more vital to the health of your finch if you finch is a picky eater that will not accept most fresh foods. Excess of some dark greens (spinach, dandelion, broccoli stem & kale for example) can leach calcium from your finch's body. They contain oxalates that can bind to calcium and prevent it from being absorbed by the body. While these foods are actually high in calcium themselves they can do more harm than good if given to often. Cooking these foods before giving them to the finches will help decrease the effect of the oxalates. Remember, too much of any one thing is always bad. If your finch doesn't seem to like something, try something else. 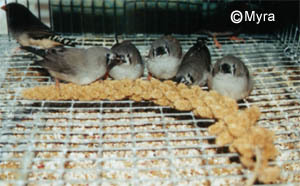 Just like people, individual finches will have food preferences. Always keep seeds and fresh water available. It's also very important to remove fresh foods from the cage each day before they spoil. Finches are just as likely to get sick from spoiled or moldy food as you would.